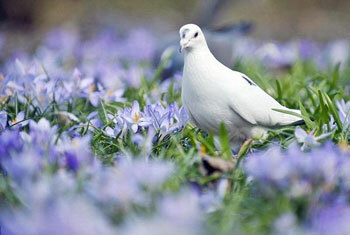 Pigeons are thought to be best at color detection ability of any animal on Earth! Pigeons are often used in search and rescue missions. They can actually see ultraviolet light, part of the spectrum which is invisible to human eyes. Is bird's vision superior to our vision??? Without vision our world would be dark, finding our way around the world be much harder, and we would miss out on an immeasurable amount of beauty. Eyes are an essential part of life for most humans, and, as we will see, they are no less important to our friends in the animal kingdom! For many centuries, scientists were in the dark about what and how other animals see. Recent scientific investigation has revealed an astonishing world of vision diversity: like the dragonfly – its brain works so fast that it sees movements as if in slow motion; or the pigeon – which is capable of detecting more precise gradations of color than the most advanced computer program. Not all animals see the world as humans do. For many animals see the world in fuzzy grey shades, pale colors or very washed out. Some animals can see in complete darkness, whereas some can see colors beyond the visual spectrum, that we even have never seen. There are animals that can use binocular vision to spot prey from thousands of feet. If we observe the way animals around us see things, we will come across very interesting facts. For example, dogs and cats are color blind. They can see pale shades of color. They tend to have better vision than us as they have better peripheral vision and very sensitive eyes to movement. These traits are helpful for them to hunt. The incredible world of vision diversity Just have a glance over these examples. All eyes sense light — but they do this in many different ways. If we wonder how snakes see, they pick up infrared heat signals from surrounding warm objects and detect their prey. Whereas in horses and zebras eyes are pointed sideways which enables them to have peripheral vision. This excellent peripheral vision helps them escape danger when necessary. If we have any doubt about how insects and bees see, they use compound eyes that are made of thousands of tiny lenses placed in a honey comb pattern. Each lens makes up a small part of overall picture similar to jigsaw puzzle. Birds and Humans are ‘sight animals’. Vision is dominant sense organ of nearly all birds, as good eyesight is essential for safe flight. Birds have a number of adaptations that gives them visual acuity superior to that of other vertebrate groups. The reason for this can be found in human evolutionary history. Our ancestors were small tree–dwelling animals. Our forefathers, when leaping from branch to branch for snatching the prey with hands, tried to smell location of food. But, since in the breezy treetops odors dissipate quickly, they do not provide good ques for detecting food, enemies or mates. Hence our ancestors depended on eye sight. Thus, in course of evolution, they developed sharp, binocular vision. Naturally birds, flying higher and faster than primates leap, also developed sight as their device for orienting to the world. In most of the birds, eyes are placed to side of the head so that each of the eye can scan separate area. Birds have two eyelids in addition to third transparent movable membrane that sweeps horizontally across the cornea of the eye. This membrane generally lubricates the eye, and also acts as a contact lens in most of the aquatic birds. The eyelids of a bird are not used for blinking, though the lower eyelid rises to cover the eye. 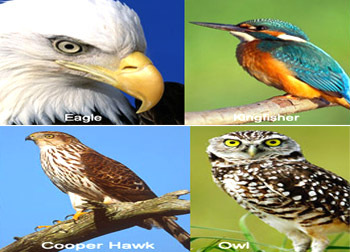 Binocular birds In birds the eyes tend to rotate towards the front of the head which will enable them to have better binocular visual field. Most of the birds have well developed binocular vision, especially in predators. In order to have a proper image and estimate ever–changing distances to moving prey, the visual fields of each eye must overlap, almost completely like in human beings. In birds the eyes tend to rotate towards the front of the head which will enable them to have visual field that overlaps at least to some degree. For example, in owls, the visual field completely overlaps like us. Some of the birds whose binocular vision is minimal, seem to depend on differences in apparent motion between close and distant objects for much of their depth perception. Birds can resolve rapid movements better than humans, for whom flickering at a rate greater than 50Hz appears as continuous movement. Let us see how this happens. The road side telephone pole seen from the window of a moving car appears to pass more quickly than the faraway landscape for us. Similarly, when bird's eye move, closer objects appear to move at a faster rate than that of distant objects. Thus, birds can identify the object that is near and far. Birds adapt different methods to enhance the distance measuring ability. For example, some birds like waterfowl, shorebirds (bob) move their head up and down often. Pigeons move their head back and forth while walking. Even perched New Guinea Kingfisher, moves up and down on their legs before diving after prey, to estimate the distance. You can also see how this works by moving your head with one eye closed and observe the relative motion of close and distant objects. ‘Hawk-eyed’ is the term that accurately describes most of the birds. In fact, there is evidence that hawks can distinguish their prey at 2 or 3 times the distance that a human eye can detect. One of the reasons, for the birds having such visual acuity is by having relatively large eyes. For example, a starling’s eye accounts for 15% of the head weight when compared to human, whose eye weight is less than 1% of the weight of the head. Moreover, evolution has played a major role by arranging the structure of bird&apos;s eyes in such a way that each eye functions very much like a telescope. The main structures of the bird&apos;s eye are similar to those of other vertebrates. There are few differences in the structure of the bird&apos;s eye that makes its vision so good. In birds, the lens is almost flattened, placed comparatively far from retina, which gives long focal length. The long focal length produces large image that appears bright on the retina as the large pupil and highly curved cornea admit plenty of light. Crompton&apos;s muscles that are present only in the eyes of the bird can change the shape of the cornea, thus giving them a greater range of accommodation than in mammals. The density of photo receptors in the retina critically determines the maximum attainable visual acuity. 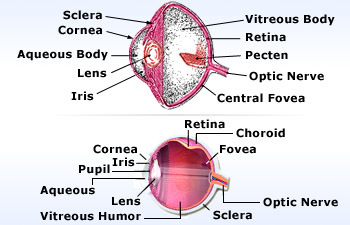 Like in other vertebrates, the retina in birds consists of photosensitive receptor cells such as rods and cone cells that are associated with neurons and blood vessels but the difference lies in the density of photoreceptor cells which is very high in them. For example, humans have about 200,000 photo receptors per sq mm, whereas, birds like house sparrow and common buzzard have 400,000 and 1,000,000 photoreceptor cells per sq mm. Waxy look of berries in bird's point of vision The waxy surfaces of many fruits and berries reﬂect UV light that might advertise their presence to birds. Birds have the ability to detect color differences that humans not register. This detailed discrimination of light, along with the ability to see UV light gives them a richness of color vision that humans cannot even imagine. Birds can detect UV light that is involved in the courtship. The plumage patterns of most of the birds are UV which is visible during courtship. Some of the bird&apos;s sexes that appear similar to the naked eye possess patches on their feathers that are reflective to UV light. The UV receptors may also help in foraging for food. 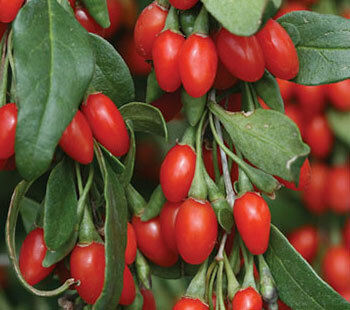 For example, most of the fruits and berries are visible to the birds as the waxy surfaces of the fruits and berries reflect UV showing their presence. Birds like common Kestrels are able to detect voles (a kind of rodent), by the trails of urine and faeces that reflect UV light, making them visible. Birds are good at perceiving things. They can detect slow moving objects such as the movement of sun and constellations across the sky. This extreme ability enables them to migrate to orient themselves. Another ability of birds that separates them from other vertebrates is to obtain steady image while flying or when perched on a swaying branch by holding their head as steady as possible with certain reflexes. Multiple receptors for better vision The retina of birds has large number of receptors per square millimeter that determines the intensity of visual acuity. The keenness of birds eyesight is due to various factors. 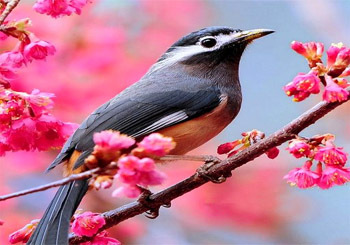 The retina of birds has large number of receptors per square millimeter that determines the intensity of visual acuity. Thus, the more receptors an animal has, the higher its ability to distinguish each object at a distance. Many birds have receptor cells, rods and cones far more in number than humans. For example humans have 38,000 receptor cells per square millimeter whereas in birds there are about 65,000 per square millimeter. In birds like raptors, a prominent eye ridge and its feathers above and in front of the eye gives them their distinct stare by protecting the eye from dust, wind, and debris and shields the eye from excessive glare. Adaptations for vision in nocturnal birds include large sized eyes, large number of closely packed retinal rods and absence of cone cells as color vision is not necessary in night. The retinae in these birds possess a reflective layer that increases the amount of light each photosensitive cell receives, allowing the bird to see better in low light conditions. How birds see in water? Special flexible lenses allows greater optical accommodation for good vision in air and water. The accurate vision in waterbirds is also due to certain adaptations. Seabirds such as gulls and terns have red colored carotenoid pigments in the rods and cones cells of their eyes that help them to improve contrast and sharpen distance vision. These pigments also help to locate shoals of fish. Though birds like auks and divers that feed on underwater fish have few red oil droplets, they have special flexible lenses that allows greater optical accommodation for good vision in air and water. In case of penguins, though they are thought to be short–sighted on land, the presence of flat cornea and strong lens facilitates it to adapt to underwater swimming. But in the Hooded Merganser a part of lens bulges through the iris enabling it to see when submerged. 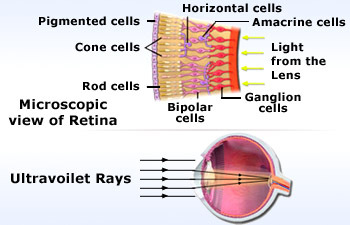 Rods and cones are the two kinds of light receptors in a bird&apos;s eye. Rods are sensitive to small quantities of light so they are better for night vision. Cones are better for day vision as they are sensitive for large amount of light and can detect specific wavelengths of light (colors). Generally cone cells are sensitive to primary color wavelengths of light i.e. red, green and blue. 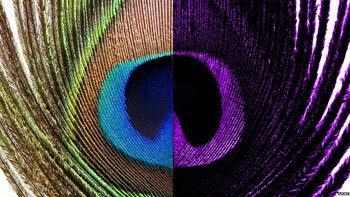 But birds have extra pigment in cone cells, that's why they are tetrachromatic i.e. possessing UV or ultraviolet sensitivity along with red, green and blue. Now, when the pigment absorbs light, retina changes its shape and alters the membrane of the cone cell affecting neurons. In this way, the neurons possess information from several photoreceptor cells, which in turn triggers a nerve impulse that relays along the optic nerve to specialized visual centers in the brain. The unique feature of cone cell that exists in birds is that, each cone cell consist of a colored oil droplet which is placed in such a way that light passes through it before reaching the visual pigment. The oil droplets act as filters by narrowing the absorption spectra of the pigments that reduces overlapping between pigments and increases number of colors that a bird can discern. Six cone cell droplets have been identified.